One thing I have noticed about my students is many of them struggle with science vocabulary. It totally makes sense when I think about it. Yes, we cover it in science, but how often are they interacting with these words beyond that? Not a ton. I decided to solve that problem by building in more exposure to the science vocabulary that my students will be tested on. First off, I wanted to solve the problem of repeated exposure so I thought about how to maximize the time my students spent reading and interacting with our vocabulary in science. With our science time being limited to 30-40 minutes a day, there just isn't time to teach, do experiments, and spend a lot of time doing science vocabulary. Therefore, I went for strategic placement of science into the word work section of reading. I mean why not go for double duty and cover my word analysis and decoding standards while I cover the science vocabulary, right? Picking vocabulary is one of the most important parts of the whole process. I want to focus in on the words that are going to be the highest impact for my students. So I started by picking the 10 most important words for each unit. I start by picking the 10 most important words for each unit. These were the words my kiddos have to know…and that my students learning English often struggle with. I decided to have the kids cut and sort these words. Sometimes the kids sort the words by length. Other times they put them in ABC order. I can also differentiate so my kiddos who need lots of support with ABC order might put them in order by length independently and alphabetize them with me. Once the words are all sorted. The students do one of three activities. They might count the syllables, count the vowels, or write a fraction to show what part of the word is consonants. Again, the activities are great for differentiation because the biggest idea is just making the kids familiar with the words. Create a glossary of science vocabulary. The kids glue the strips into their science journal to create a personal glossary. They put the words in alphabetical order by unit and record a definition for each word. Then they can draw (and label) an illustration to represent the word. I love this part. It really tells me if they understand the vocabulary at the end of our science unit. Why three activities for each set of science vocab? One set for word work when we start the unit in science. One as a unit review and wrap up. One for a final refresher that rotates into word work later in the year as a review. Want to try these out? 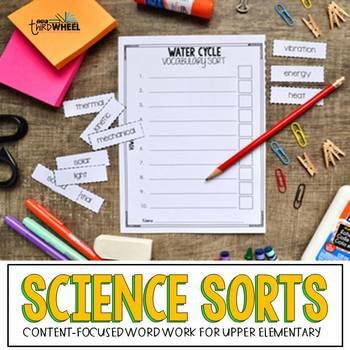 Just download the preview from my science vocabulary sorts to try out the matter vocabulary in your word work for free. And there you have it, another easy-peasy way to bring content vocabulary into your language arts instruction while still covering those standards. How do you give your students extra opportunities to interact with new content vocabulary? I love this idea. I teach 5th grade. I’m wondering how do you make your worksheets? I could definitely see this helping my kids who struggle with vocab as well. I design them in PowerPoint and use my scope and sequence and state standards to help me select appropriate vocab words. The kids really love these, and they stay super engaged.